Intriguing nuggets regarding the intersection of work and happiness… a call, in a few pointed words, for an expanded, genuine work ethic. 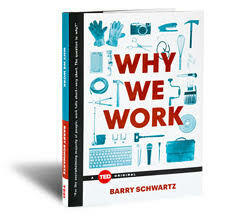 In this groundbreaking work, acclaimed writer and thinker Barry Schwartz dispels a deeply ingrained myth: The reason we work is primarily to get a paycheck. How did we come to believe this? Through fascinating studies and compelling anecdotes, Schwartz takes the reader on an eye-opening tour, illuminating the destructive way work operates in our culture, and ultimately empowering the reader to find their own path to good work. Why do we work? The question seems so simple, but the answer is surprising, complex, and urgent. We’ve long been taught that the reason we work is primarily for a paycheck. In fact, we’ve shaped much of our society to accommodate this belief. Then why are so many people dissatisfied with their work, despite healthy compensation? And why do some people find immense fulfillment and satisfaction despite working low paying jobs? Through this investigation of workers from all walks of life, Professor Barry Schwartz dispels this myth. 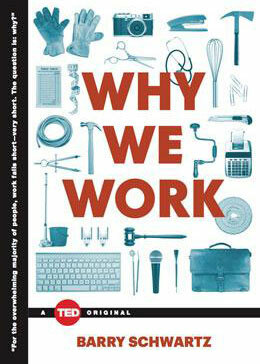 From hospitals to hair salons, auto plants to boardrooms, Schwartz reveals the trends and patterns that lead to happiness in the workplace, ultimately proving that the root of what drives us to do good work can rarely be incentivized, and that the cause of bad work is often an attempt to do just that. How did we get to this tangled place? How do we change the way we work? With great insight and wisdom, this book shows us how to take our first steps toward understanding, and empowering us all to find great work. For the overwhelming majority of people, work falls short—very short. The question is: why? Read Barry's Op-ed in the New York Times Sunday Review: "Rethinking Work"
As seen in TIME: "Why We Work"
Read this fantastic interview with Barry in The Atlantic: "Beyond the Paycheck"
Listen to an awesome interview with Barry on MPR: "'Why We Work': It's more than money"
Watch an interview with Barry Schwartz on Bloomberg: "Cash, Happiness, or More: Why We Work"
Watch an interview with Barry Schwartz on MSNBC: "How to find happiness at work"
Barry Schwartz is a professor of psychology at Swarthmore College and the author of Why We Work, The Paradox of Choice, and Practical Wisdom. His articles have been published in The New York Times, The New York Times Magazine, the Chronicle of Higher Education, Parade Magazine, USA TODAY, Advertising Age, Slate, Scientific American, The New Republic, Harvard Business Review, and The Guardian, and he has appeared on dozens of TV and radio shows, including Morning Edition, Talk of the Nation, Anderson Cooper 360, the Lehrer News Hour, the Colbert Report, and CBS Sunday Morning.